This post for Six Tips for Freezer Meal Success originally appeared on the Produce For Kids blog. I’m sharing it here in case you missed it! If you’ve followed me for awhile, it’s no secret that I love cooking for my freezer! Filling your freezer with healthy homemade meals can save lots of time and money in the kitchen! 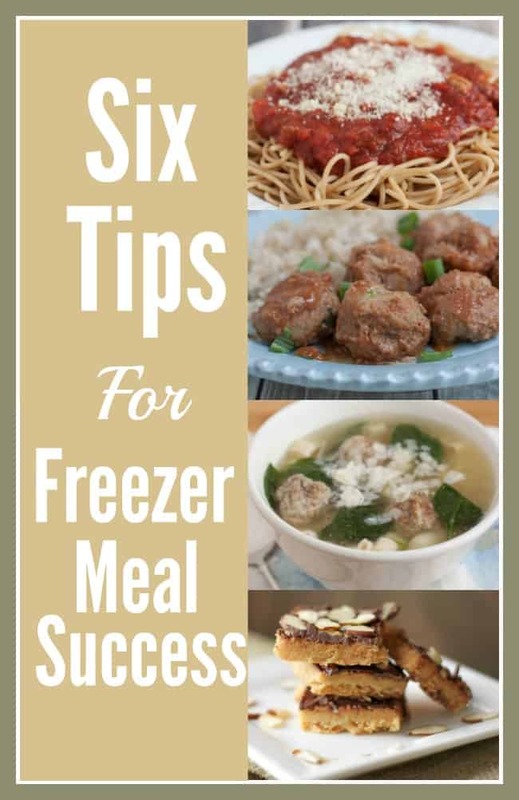 Get started with these Six Tips for Freezer Meal Success! Filling your freezer with prepped meals is a great way to save time and money in the kitchen. When you prepare meals for the freezer it allows you to do batch cooking and also take advantage of sales at the grocery store or deals at the wholesale clubs, plus you won’t feel the need to get take-out as often. Getting started is easy when you keep these Six Tips for Freezer Meal Success in mind. You can freeze it all. Or almost. You’d be surprised how many ingredients you can freeze. Meat and seafood freeze very well as do many fruits and vegetables. Some items freeze well but can’t always be used in their original form thawed. Examples of this include onions, berries, peppers, and other produce that have a higher water content. That’s ok! You can use many of those ingredients in soups, casseroles or smoothies. Quick guide to freezing meals. Since freezer space can be at a premium for some, learning how to efficiently store your meals is key. Zip top bags are a great way to store raw ingredients that you will thaw and cook later or prepared sauces or soups. Be sure to let out the extra air before sealing so you can flatten the bag for more efficient storage. Casseroles and similar meals can be stored in aluminum pans or you can line a favorite dish with aluminum foil, add your ingredients. I especially like to put ingredients and marinades in a bag so that when it is thawing, it is marinating too. Be sure to always thaw your meals in the refrigerator for the best food safety practice. Consider portioning out meals also into individual servings for a quick breakfast, lunch or dinner on the go. One of the most frequent questions I get is whether meals need to be fully cooked before storing in the freezer or not. The answer is: it depends! Things to consider are how much freezer space you have and how much time you have to prepare ahead and whether you want to. For example, for soups, I often combine all the ingredients in a bag minus the broth which I will add the day I want to cook and serve. If space is a concern you can get a head start on your meal preparation by preparing some of the ingredients for a recipe to store in the freezer until you’re ready to use them in a meal. For example, dice or chop up fresh vegetables like onions or peppers or you grill up several chicken breasts at one time and store them in a labeled, freezer safe container or bag. When you’re ready, simply pull out what you need to add to salads, soups, casseroles and many other meals. Don’t forget! Label and date your freezer meals. When you’re filling your freezer with your prepared meals or ingredients, don’t forget to label and date the package. I promise, you may think you’ll be able to remember what’s in there and for how long, but once frozen, some things start to look a lot alike. I LOVE these resusable LabelOnce labels. As you add meals to your freezer, start a list. I like to keep my list near my freezer then grab it when I’m doing my meal planning for the week. That way it’s easier to decide what to use up first so that you can enjoy items at their freshest. The general guideline is that you can keep items in the freezer up to three months for best quality but some items will last longer. Just beware of freezer burn if you leave items in the freezer too long. Be sure to check out my post, How to Organize Your Freezer in 5 Easy Steps for more ideas and a free inventory printable! Freezer meal success can be yours by following these tips. Remember, you can start slow by doubling a recipe you are already making or make two or three recipes for your freezer and before long you will become a pro. Get Started for Freezer Cooking Success – My Favorites! Wondering where to get started with freezer cooking? Check out some of my favorite freezer friendly recipes like these for your freezer meal success!